We are culturally fascinated by children who do evil things. Or maybe is isn’t fascination, it’s fear. We want to examine them to reassure ourselves that something was wrong. Something that could never go wrong in our houses. If only we dig deep enough, there must be an explanation, something we can avoid. Fiction has opportunities that fact does not – authors can make pat conclusions. They can have explanations. But it seems as if even they have trouble coming up with anything that would be reassuring. Thus works of fiction about violent children tend to mirror reality. Such is the case in Finding Jake. 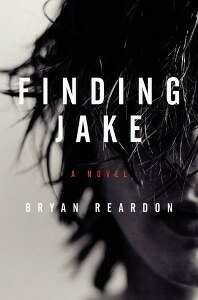 Finding Jake is about a school shooting, perhaps one of the greatest of all parental fears. It’s actually the story of Jake’s father – Simon Connolly. Simon is a stay-at-home dad. He’s the only one in the neighborhood. It made financial sense when his children were born that he would stay home and care for them while his wife, a well-paid attorney, worked full time. But he’s always been a little thin skinned about it. And a little uncomfortable in the role. Not with his kids, but with the rest of the world, who he thinks judges him. Can he really be a good primary caregiver? Does it make him feel like less of a man? Will he have trouble relating to the neighborhood moms? The answer is yes, to all three. When the worst happens and there is a shooting at the high school attended by both his son and daughter, he faces a nightmare. Not only is his son missing, he’s a suspect. Now the entire world will gaze at him with the steely focus of the fearful and look for everything he might have done wrong. He’ll be doing the same thing. The only thing that can help any of them is if they find Jake, and find out what really happened. My biggest issue with Finding Jake isn’t with this book at all, but in its almost laughable similarity to the bestselling Defending Jacob. Right down to the kid’s name! Both involve fathers wrestling with their reactions to accusations that their sons are involved in something horribly violent. Both are told from the point of view of the father, which in both cases significantly (and deliberately) colors the narrative. Both illustrate the blazing spotlight and relentless press that surrounds anyone even remotely tied to a violent crime committed by a child. The question, I guess, is which book does those things better. Finding Jake centers more on the father as an individual, as a parent. There is little if any legal aspect to the book (something very prevalent in Defending Jacob). Both succeed in winding up the suspense about what really happened and maintaining it throughout the book. Both present complicated situations, and neither falls into easy answers. Ultimately, I think the choice comes down to what you’re looking for. If you’re interested in a courtroom thriller, Defending Jacob is the better choice. If you’re interested in the scrutiny of a parent who has always felt out of his element, Finding Jake is the better choice. Both books are good, but I can’t think of a single good reason to read both (I did that for you). I’m going to give Finding Jake 3 stars out of 5, and a qualified recommendation – don’t bother if you’ve already read Defending Jacob unless this genre is one that you follow really closely. Certainly don’t read them in the same calendar year (yeah, that was me, too).